Cleanse your facial hair with the No. 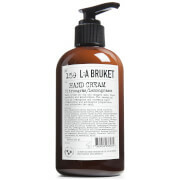 154 Beard Wash from L:A BRUKET. Boasting a mild formula, the nourishing beard wash cleans the fiber to leave the beard in optimum condition. The rich formula is enriched with Witch Hazel and Chestnut extracts, which work harmoniously to nourish and sooth. Fortified with Laurel Leaf essential oil to clean and calm, the beard shampoo refreshes facial hair to leave you feeling groomed and looking well cared for.